Your mouth is a highly complex system of bones, muscles, nerves and teeth. The process of digestion begins in the mouth with mastication (chewing), and saliva production. These processes leave the mouth prone to bacterial infection. The food we eat contains sugar which feeds the bacteria known as plaque. Plaque takes in the sugar and excretes acid which damages the protective enamel layer on the teeth, leading to tooth decay and poor dental health. Aside from creating cavities in the teeth themselves, which can lead to fillings, root canal treatment, or even extraction depending on severity, the damage from plaque can also cause sensitivity in the teeth and/or periodontal disease, which is the name given to problems affecting the gums, and the ligaments and bones of the jaw. If your dental hygiene routine is lacking, you will likely be suffering from these warning signs of dental health problems. 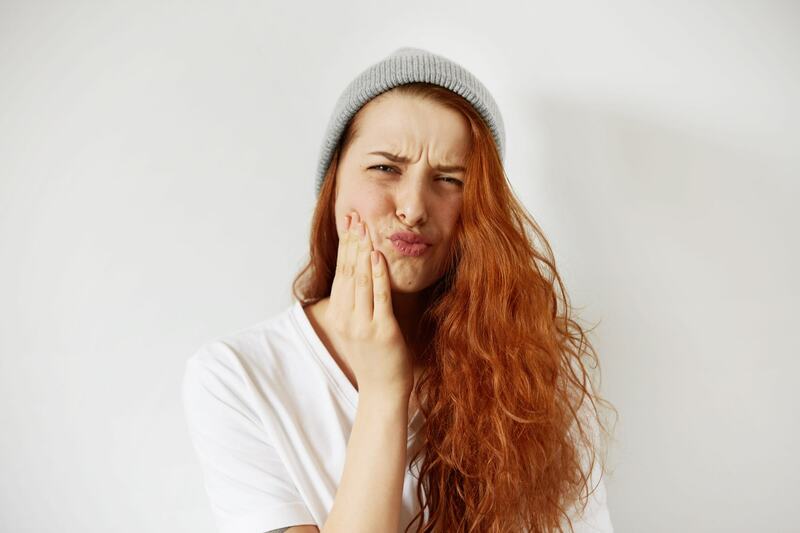 These warning signs include persistent bad breath, dry mouth, discoloured teeth, swollen or bleeding gums, sensitive teeth, and tartar build up. Having persistent bad breath, also called halitosis, can be a real drawback in terms of social interactions, but it also has bad connotations for your oral hygiene and dental health. Persistent bad breath can often be accompanied by a bad taste in the mouth and can be an early warning sign of periodontal disease. Persistent bad breath can also be caused by a condition called Xerostomia, or dry mouth, which affects saliva production. Saliva plays an important role in protecting the teeth, so if you have a consistently dry mouth you should speak to your dentist about treatment options. Aside from the aesthetic advantages of a nice, pearly white smile, the appearance of teeth can also tell a story about your dental hygiene. While discoloured teeth do not typically pose any health risks directly, they can highlight a lack of care being taken to keep your teeth and mouth clean. By brushing regularly with a fluoride toothpaste, you will remove many of the small surface stains on your teeth before they become a problem. If your teeth are stained from external sources such as smoking or coffee consumption, talk to your dentist about whitening options. If you are proud of your smile you are more likely to take good care of it. If your face suddenly started bleeding every time you washed it you would likely rush to the doctor, however many people ignore the same from their gums. Inflamed, swollen and bleeding gums is a condition called gingivitis, and can be an early indication of periodontal disease. If left untreated periodontal disease can cause severe problems in the mouth, including loose teeth which may need to be extracted in severe cases. If your gums bleed from light brushing you should seek advice from your dentist about treatment before the condition worsens. As the protective enamel of the teeth is eroded it exposes the tiny tubes which lead to your dental nerves. Once these canals are exposed they leave your nerves susceptible to extreme temperatures and acidity. This is what causes the pain associated with sensitive teeth. Erosion of the enamel is caused by plaque build up, acidic foods, over brushing and damage to the tooth. If you are experiencing sensitive teeth your dentist will be able to offer advice on minimising the damage and restoring your enamel. As mentioned earlier, plaque is made up of a colony of bacteria in the mouth. The acid produced by plaque is one of the major factors in tooth decay, but plaque becomes an even bigger problem when it calcifies into tartar. Once plaque hardens into tartar it is no longer able to be removed by brushing, and must be removed by either a dentist or dental hygienist with special equipment. Plaque is very tough, even before it calcifies, and must be physically removed from the teeth. This is why using an antibacterial mouthwash alone does not stop the spread of plaque. The plaque must be constantly broken up by the physical action of brushing the teeth with a toothbrush and flossing between the teeth using dental floss. For advice on the most effective brushing techniques, and other aspects of your oral hygiene, speak to your dentist or dental hygienist.